I had a debate with myself regarding whether or not I would write a post on the massacre which occurred yesterday. As the predictable posturing and lobbying has begun, I feel the need to put some perspective out for those care enough to look beyond the hype and spin and try to pull some knowledge out of something so senseless and tragic. The calls for gun control have already begun. I don’t care which side of that debate you stand on; gun laws have nothing to do with stopping a crime like this one. The same day, there was a man attacked students in a school in China, he had no access to a gun, so he used a knife. Gun laws will only affect the choice of weapon, not the actual crime. You may not like it, but there it is. I am going to give my take on things, but before I do, I wish to say that it makes me sick that families were not even moments into the grieving process when politicians were already trying to carve out their agenda based on a senseless tragedy. The first concern should be with the survivors of the attack and the families of those lost. 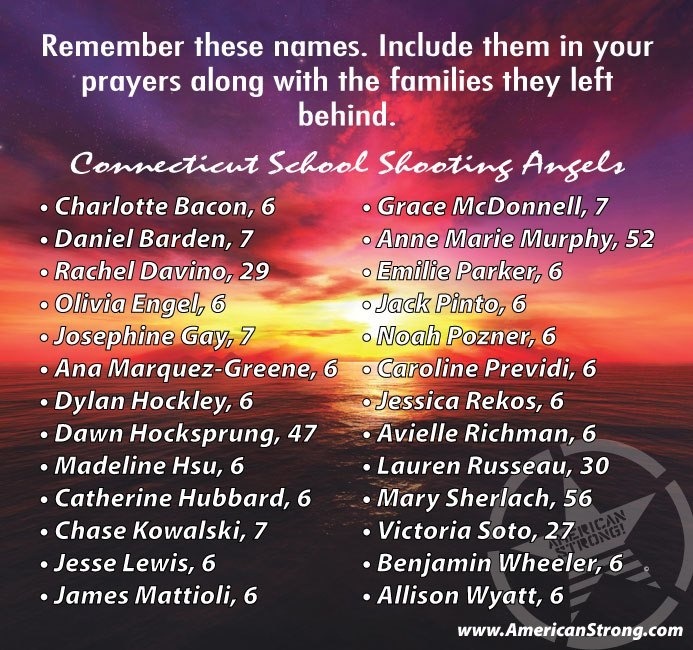 When I look at the list of victims on the photo at the top of the page (which was pulled from the American Strong FB page, hope they don’t mind), I admit I tear up. As I did when I first read of the massacre. See, I work with kids. In a public school. The mission of the KICKSTART KIDS Foundation is to Change and Save Children’s Lives. Children are the main part of my day, and as a teacher, as a parent, and as a decent human being, this tragedy hurts me at the core. I went home and held my four year old for the longest time. Had my two oldest children been in the country, it would have been the longest group hug in the history of our species. As stated earlier, if you get caught up in the spin on gun control, and new gun laws and all of that other BS that the media is pushing, you will miss the point entirely. We do a huge disservice to our kids. Too many people think that Nintendo and Sony = Babysitter. There are video games that very closely simulate being a first person shooter. In Paducah, Kentucky, Michael Carneal, a fourteen-year-old boy who stole a gun from a neighbor’s house, brought it to school and fired eight shots at a student prayer group as they were breaking up. Prior to stealing this weapon, he had never shot an actual handgun before. Of the eight shots he fired, he had eight hits on eight different kids. Five were head shots, the other three upper torso. The result was three dead, one paralyzed for life. The FBI says that the average, experienced, qualified law enforcement officer, in the average shoot-out, at an average range of seven yards, hits with less than one bullet in five. How does a child acquire such killing ability? What would lead him to go out and commit such a horrific act? There is perhaps no bigger or more important issue in America at present than youth violence. Jonesboro, Arkansas; Paducah, Kentucky; Pearl, Mississippi; Stamps, Arkansas; Conyers, Georgia; and of course, Littleton, Colorado. We know them all too well, and for all the wrong reasons: kids, some as young as eleven years old, taking up arms and, with deadly, frightening accuracy, murdering anyone in their paths. What is going on? According to the authors of Stop Teaching Our Kids to Kill, there is blame to be laid right at the feet of the makers of violent video games (called “murder trainers” by one expert), the TV networks, and the Hollywood movie studios–the people responsible for the fact that children often witness literally hundreds of violent images a day. Authors Lt. Col. Dave Grossman and Gloria DeGaetano offer incontrovertible evidence, much of it based on recent major scientific studies and empirical research, that movies, TV, and video games are not just conditioning children to be violent–and unaware of the consequences of that violence–but are teaching the very mechanics of killing. Their book is a much-needed call to action for every parent, teacher, and citizen to help our children and stop the wave of killing and violence gripping America’s youth. And, most important, it is a blueprint for us all on how that can be achieved. This is a real issue, largely unaddressed by anyone. Why would the politicians address the source when they can use tragedies to advance their own agenda? Then in steps the media, and they get people angered about how nothing has been done about the problem, and they convince the masses that this new law is what we need to prevent the unpreventable, and unpredictable. Here is the main problem with this type of violence that no one really wants to face. Not every loner teen turns into a killer. I didn’t. I was more alone than anyone I have ever known up to this point in my life. Not every bullied teen turns into a murderer. I didn’t. I was bullied to the point of considering suicide. Not every socially awkward, inept, unattractive, unappreciated, cast off kid ends up killing people for no reason. And a lot of other people didn’t either. Don’t buy into the lies. There are people who care about other people regardless of their own circumstances, and there are people who do not. Again, going back to Grossman and Christiansen, there are three types of people; sheep, wolves, and sheepdogs. And as they point out, we humans have a choice regarding which one we will be. Please take the five minutes needed to read the article I linked on the three types. This type of violence is completely unpredictable. And for as long as the media plasters the face of the criminals on every channel and website, they will continue to outdo their predecessors. There are no easy answers. Hug your kids, and tell them you love them. Pray that your kids become adults, but also pray that they outlive you. Be kind. People are so set on finding a reason to be offended, like the owner who sees any stick as “good enough” to beat the dog with. Be kind. Try to use just a little understanding, and you may find compassion. I saw a clip on YouTube where Mr. Norris mentioned that if KICKSTART KIDS had been available in Littleton Colorado, the massacre at Columbine High School would not have happened. Sometimes I wonder how many such incidents have been prevented by the KICKSTART KIDS program. This, obviously, can never be known. But ask yourself if there is any chance that you could show some kindness to a person, and perhaps prevent them from going over the edge. People are funny creatures. A person can be our best friend in the world, but if they burn their hand, the best we can manage is to feel sorry for them. We only actually feel pain if we are the one burned. But the human capacity for empathy allows us to try to feel the person’s pain. Be kind. Understand that other people hurt too. Maybe we can slow this turn toward hate that seems to be spiraling almost out of control. I recommend that you also visit the Rachel’s Challenge website. Rachel Joy Scott was the first victim of the Columbine massacre, and her Father started Rachel’s Challenge to help keep her idea of being kind out there when many people would have been stuck in the revenge mindset. In closing, I sincerely hope that the victims and their families will be the focus of the days to come. I hope that they may heal, and grow strong. And I hope that people can find a way.